An easy paper collage and drawing activity to celebrate the Melbourne Cup. Experiment with different textures when creating rubbings or just use rubbing plates! An easy and quick activity for primary levels with effective results. Create a display of all the horses! Cover a large sheet of Cover Paper with a texture using Oil Pastels and a Rubbing Plate. Cut out a shape that resembles a horse’s head, two ears and the neck of a horse. Glue these onto a sheet of Cover Paper. Use a black Oil Pastel to draw in the facial features and mane. 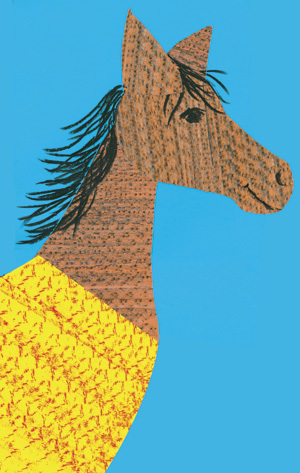 Create a horse blanket using another colour of Cover Paper covered in a texture using Oil Pastels and a Rubbing Plate.